Last week we got confirmation that some long ago leaked shots of the upcoming Moto X4 did in fact depict the phone's final design, and earlier today the Brazilian equivalent to the US FCC outed quite a number of live images of the prototype that went through its testing. 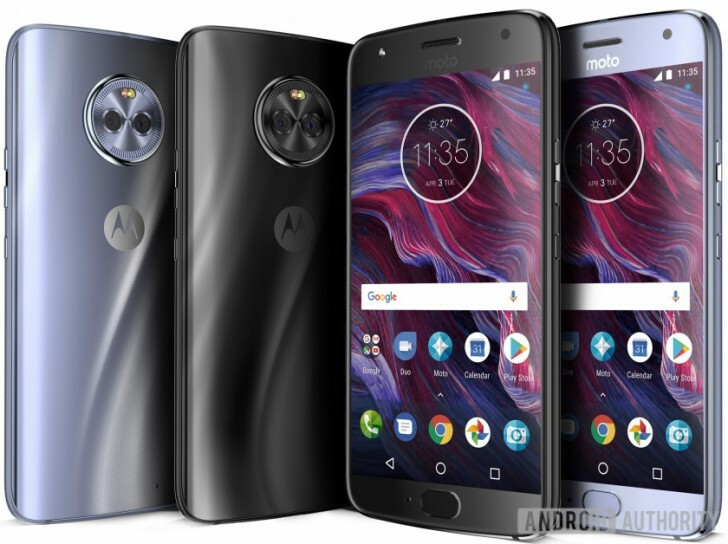 Now we have an image showing leaked press renders of the Moto X4, adding to the barrage of news related to this smartphone. Thankfully, though, these came alongside full spec details. The Moto X4 will have a 5.2-inch 1080p touchscreen, and will only be available in the two colors you can see below: Super Black and Sterling Blue. Its dimensions are 148.35 x 73.4 x 7.99 mm, and it tips the scales at 163g. The selfie cam is a 16 MP unit with f/2.0 aperture and 1.0µm pixel size, which will support 4K video recording at 30fps and 1080p at 60fps. Underneath the screen there's the now traditional Moto fingerprint sensor, while the back of the phone is made of glass. The dual rear camera setup consists of a 12 MP main shooter with dual pixel autofocus, f/2.0 aperture, and 1.4µm pixel size, as well as an 8 MP ultra-wide angle sensor with f/2.2 aperture, 1.12µm pixel size and a 120-degree field of view. There's a dual-LED flash on the back too, and you'll be able to add depth of field effects to your photos of course. A 3,000 mAh battery will keep things chugging along, which will support the TurboCharge feature that should see the handset get hours of power from mere minutes of charge. The X4 will be IP68 certified for water and dust resistance. As for the chipset at the helm, this will be Qualcomm's Snapdragon 630. RAM and storage combinations are as follows: 3GB/32GB in Europe, North america, and Latin America; 4GB/64GB in the Asia Pacific region. And Samsung could only get F2.4 and 1um on the camera that focuses on the subject in 8.5mm of a device. The bazel protects the screen from breaking when falling.